The backseat car Organizer has Multi-purpose storage pocket, great for storing toys, rattles, phones, snacks, water bottles, and other things. -Car organizer comes with iPad/Tablet Holder can hold up to 12 in, Note Ipad needs a folder case to hold. -Gives your rear passengers the freedom to watch their favorite movie while keeping their hands free. -It can Protect your back seat from muddy kicks and spills from children. You can have it all in one, an Organizer, kick mat seat protector and IPad/Tablet holder. It contains a large flat storage pocket, perfect for storing maps, notebooks, coloring books. 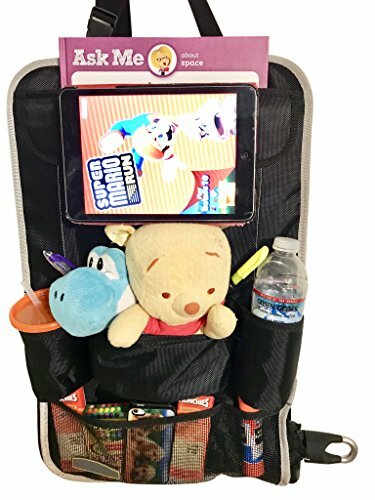 With a Bottle holder pockets to keep your child's favorite drink within reach, not on the floor, Can make your Family trips fun and stress free with the Backseat Organizer. PERFECT TO KEEP YOUR CAR ORGANIZED: This organizer has multiple pockets and compartments to storage as many different things. Different sizes and shapes that fit any type of object, Ideal for your kid's accessories, Exp. toys, sippy cups, water bottle, crayons diapers wipes books etc. and the best of all Has a iPad/Tablet Holder bag. Ipad/tablet NEEDS to have the folder case to be able to hold. STABLE AND STURDY: Backseat Storage Bag has a special design with the extra reinforcement and durable. Thanks to that. The stronger material and smarter design make it stable and sturdy. Put as many things as you want in there! STORAGE COMPARTMENTS: car Organizer has 8 different compartments. Two big pocket for bulkier items (books, diapers, crayons, toiletries, ) or I pad/Tablet holder. two bags to hold drinks. Four extra compartments to hold (snacks, Toys, crayons, pencils, newspaper or Umbrella), It contains two pen/marker holders. Adjustable top and bottom straps with buckles make for easy installation and keep the backseat organizer flush with the car seat. Universal design fits most vehicles. If you have any questions about this product by FlowBargains, contact us by completing and submitting the form below. If you are looking for a specif part number, please include it with your message.